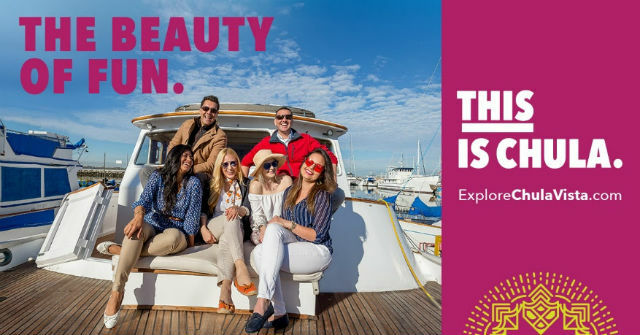 San Diego County residents and visitors will be seeing “THIS is Chula” billboards return throughout the region in addition to MTS transit posters, multi-media digital ads and social media engagement. The second phase of the campaign focuses on the beauty of the city, its natural landscapes, recreation opportunities, successful businesses, environmental sustainability programs and community pride. Chula Vista Mayor Mary Casillas Salas previewed the new campaign during her state of the city address earlier this month. The website ExploreChulaVista.com that was launched in phase one of the campaign has been updated to reflect the new messaging and features photos from all parts of Chula Vista as wells as links to recreation activities, shopping and dining, cultural arts, schools, concerts, festivals, entertainment attractions, parks, and open spaces.